David Wiese took five Essex wickets to earn Sussex Sharks an opening-game Vitality T20 Blast victory at Chelmsford - and said he didn't think he had bowled well. After Sussex's 36-run win - set up by half centuries from Michael Burgess and Laurie Evans - Wiese admitted: “It’s weird because I didn’t feel I bowled as well to get a five-fer, but sometimes in a match you get lucky and you execute your skills and it comes off. I was looking to close off the game and finish my spell on a high. My first over wasn’t very good and I was trying to pull it back after that. 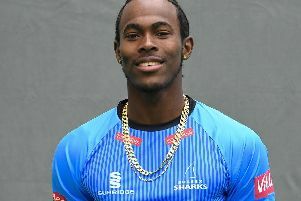 “I just tried to get through the last over with minimum damage and give Jof [Archer] the chance to close out the game. Three wickets in the over wasn’t in my mind at all. But the fielders helped me. “We’ve all seen what Jofra is capable of at the death, he can bowl a yorker at will. If you keep taking wickets in the middle overs then those coming in at the end don’t have any chance to set a tempo. Credit to all the bowlers. On debutant Rashid Khan, Wiese said: “I saw him when he was a young 16-year-old kid in the World T20 in India in 2016, I played against him there and you could see there was something special about him then. Essex captain Ryan ten Doeschate admitted: “We weren’t good enough today. They probably got 20 more than we’d like, and we fell 20 short. 170 or so and we might have put in a better batting display. But it wasn’t to be." Sussex's next game is away to Glamorgan on Sundaym then they visit Hampshire next Thursday before their first home game, versus Surrey on Friday 13.